A few weeks ago, I decided to put some of my short stories up on Smashwords to see how they'd do. With very little fanfare or advertising, I put five stories up on the site, set the price at 99 cents, and then enrolled in Smashwords' July Summer/Winter Sale, where the code SSWSF allows readers to grab a free short story. Has the experiment been worth it? I'm going to say yes. Sure, I haven't made any money off the 257 "purchases" readers have made on Smashwords. Without the promo code, however, would anyone have paid for one of my shorties (anecdotal evidence on Amazon.com suggests the answer to this is pretty much "no")? This is not the final tally, of course, there's a little less than two weeks left to get one of my stories (well, actually, ALL of them) for free (shameless self plug site link HERE). 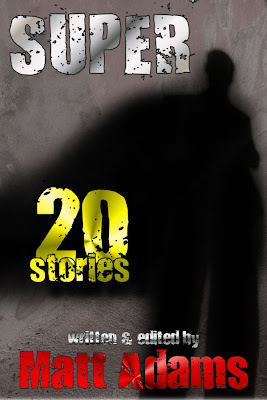 This is Super, an anthology of superhero/comic book stories that includes 20 of my original works. I'm almost finished with the layout, although I'm going to have my beta readers look through it and there's that little matter of the story I still need to finish for it. I'm wondering: does this interest anyone? Instead of getting a story for 99 cents, does 20 for $2.99 sound appealing? Working on a new story!